Ben Clanton's Squiggles and Scribbles: WORDSTOCK! I'm super excited to be headed down to Portland, OR (where I was born and lived my first seven years) next weekend for WORDSTOCK Portland's Book Festival! 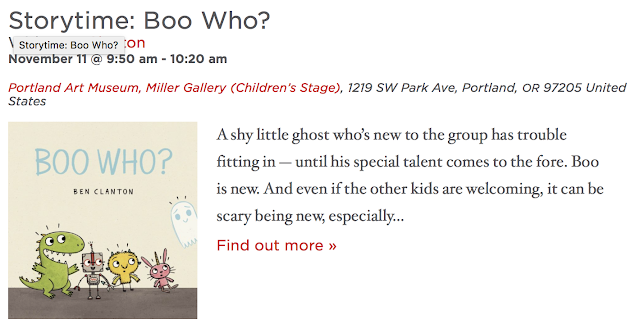 The extraordinary Emily Arrow (http://www.emilyarrow.com) will be hosting the children's stage where I will be sharing BOO WHO? at 9:50 am. I will also be talking about graphic novels and creating worlds with Jeffrey Brown and Kate Ristau at 12:30 pm! There are also oodles of other authors and illustrators that will be sharing their work at Wordstock including some of my favorites such as Vera Brosgol, Carson Ellis, Mac Barnett, Daniel Handler (aka Lemony Snicket), Matthew Holm, and Rebecca Green.